This institution, unique in its concept of education for civil aviation, has its own simulator and jet airplane for practice and professional development, so it is understandable that with a Megatrend diploma and further professional training, people find jobs in the biggest airlines. How would you briefly characterise the long-term strategy of education of Megatrend University? – The strategy of Megatrend University is – always a step ahead of everyone. That is how it was when we started, that is how it is today. Way back in 1989 we wrote a new chapter in the concept of education in what was then Yugoslavia, introducing new areas of education that did not exist then in the region of Eastern, South- Eastern and Central Europe. These were studies of management, organizational behaviour, intercultural management, etc. During early 1990 we were also the first educational institution to develop its website, through the “Beograd.com” company of Nenad Ćosić. They have been our internet provider to this day. You have been developing for nearly 30 years in accordance with new technologies and information systems. Where do you see your place in the modern system of digitisation of education? – I think we started this first in 2001, when our distance learning software was highly rated at a scientific conference in San Francisco. It was created by Dr Veljko Spasić, a United Nations expert. He turned my idea into 98 books of software code and the system, with certain regular annual upgrades, still works today. So, we are at the very top, but there are some who are slightly better, such as the IT Academy of Vesa Jevrosimović. I can say, using a sports vocabulary, that we are in excellent second place. “Megatrend” University consists of 12 faculties. Which one of them is attracting the greatest interest among secondary school graduates? What study programmes are the most popular among youth today, and which ones would you like to draw their attention to? – All of our faculties are modern, attractive, and keep up with the highest global achievements in the area of higher education. During the last few years interest has increased in our Faculty of Computer Science, Faculty of Culture and Media, and this year there was a lot of interest for the Faculty of Civil Aviation and the Faculty of Arts and Design. I would like to note our Faculty of Law, particularly its Security Department. There was a lot of polemic about the Megatrend slogan “Finish Megatrend and – get out of here”. What is hiding behind it? - I worked on that slogan personally for weeks. It does not call on youth to leave Serbia. It points out that our diplomas are recognised worldwide, as evidenced by the fact that several thousand of our graduates are working in the largest and best companies. On the other hand, the idea of the slogan was to raise even more awareness of the burning issue of youth leaving Serbia. 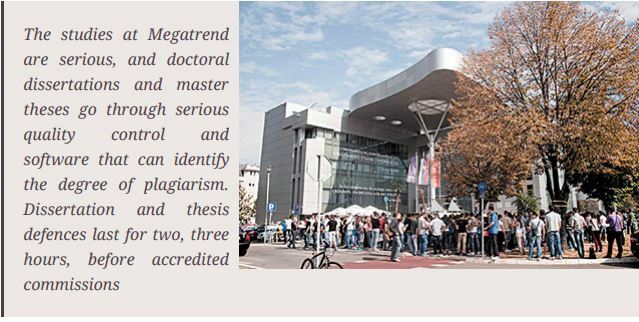 You virtual university is the first accredited institution in Serbia offering students distance learning. What kind of interest is there for this type of studies, very popular and appreciated in developed countries? – I think “on site” studies, i.e. real studying in university buildings and campuses, is a thing of the past. “Online” studies, distance learning, are the future of learning in the modern world. There are currently around 1,800 students from around the world studying at our virtual university. What kind of interest is there for the Faculty of Civil Aviation, since it is a unique higher education institution in Serbia? – Interest in our Faculty of Civil Aviation is great, not only in Serbia, but also in the region and beyond. We are a unique institution regarding our concept of education for civil aviation, we have excellent technical equipment, we have our simulator and jet airplane for the practice of future pilots, or professional development of already active pilots who aim for higher education. By recommendation of European Union authorities, pilots without higher education will not be able to fly the European skies after 2018. Many “eternal students” successfully completed their undergraduate, and some also their master and doctoral studies at Megatrend University. How do you comment on this claim? – The claim is malicious and incorrect. Our studies are serious. Doctoral dissertations and master theses go through serious quality control and software that can identify the degree of plagiarism. Thesis and dissertation defences last two, three hours in front of commissions that are, in a way, accredited for this work. For example, our former colleague Nebojša Bačanin defended his dissertation at our faculty in the area of computer science. The defence lasted over two hours before an extremely strong commission. Several months later he defended a second doctoral dissertation at the Faculty of Mathematics of the University of Belgrade. The defence lasted around 40 minutes, and he only exchanged a few sentences with the commission. A colleague recorded everything, so it is easy to determine the huge difference in the seriousness and quality of defences of both dissertations. How magisterial theses and doctoral dissertations are defended at state universities is a whole other issue. I looked at several from certain state faculties, similar to our faculties. Of the five reviewed, only one doctoral dissertation had correctly established methodological-hypothetical research frameworks, the others did not. And without that, there can be no satisfactory doctoral dissertation or magisterial thesis.